The garage is one of the most common areas to be overrun by clutter and disorganization. No one enjoys getting caught up in strings of lights when trying to get the bikes out when warm weather arrives. Avoid garage clutter with a customized storage solution from The Custom Closet Company. The need for extra storage can take over a garage and leave it unusable. 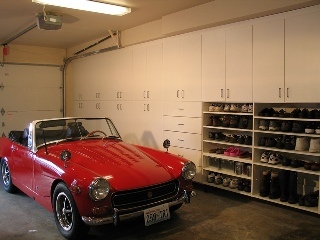 Using the garage for extra storage is a great idea, and with custom storage solutions by The Custom Closet Company, you can achieve that and still have room to park your car. What are you waiting for, take back control of your garage today and call The Custom Closet Company to do it. The Custom Closet Company will come out to your home for a free estimate, call today for an appointment!